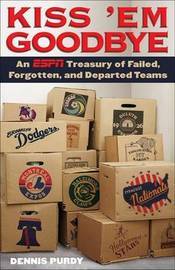 The fascinating sports history of defunct teams in baseball, hockey, basketball and more! THEY'RE GOING, GOING, GONE. . . . Their names roll off the tongue, a litany of the damned: the Providence Steam Roller, the Wilmington Quicksteps, the Cincinnati Porkers. They are the lost squads of professional sports history--teams forsaken by fans, fleeced by owners, or forgotten by time. Until now. Kiss 'Em Goodbye unearths the real stories of dozens of vanished teams that once graced--and often disgraced--North America's big leagues. Like the St. Paul Apostles, the only major league team never to have played a home game; Card-Pitt, the NFL's World War II doormat; and the Philadelphia Quakers of the NHL, a team owned jointly by bootleggers and a retired boxer who climbed back into the ring to help meet payroll. In obituaries for both big-city franchises that skipped town (the Baltimore Colts, the Brooklyn Dodgers) and small-town teams that had their brief moment of glory (the Tonawanda Kardex, the Pottsville Maroons), Kiss 'Em Goodbye commemorates mysterious fires, waterlogged basketball courts, fields tended by goats ("cheaper than mowers! "), and uniforms that broke team budgets. It's all here in a fascinating, hilarious, page-turning celebration of teams that prove it's not whether you win or lose, but that you once played the game. Dennis Purdy is the author of Super Football Challenge, Baseball on the Brain, and The Team-By-Team Encyclopedia of Major League Baseball.